The Door is Open… to who? 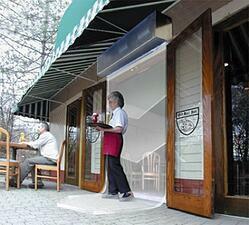 For many retail businesses, maintaining an open door policy is critical ensuring the premises looks open and inviting to customers. Unfortunately for most of Australia, this means the door is also open to whole bunch of other unwanted visitors! Open door policies also give flies, insects, dust and hot air a wide open opportunity to enter, causing discomfort and creating hygiene issues in your premises. If that wasn’t bad enough, your energy bills may skyrocket frustratingly, as you are constantly having to pump up the air-conditioning (or heating depending on which season you are in) to account for the lost energy through the doorway. Many businesses have proven the benefits of adding control measures such as Air-Curtains above their doors to limit the entry of unwanted air-bourne pollutants. You may have seen an air curtain in use but do you know how they work and whether they would be effective in your facility? 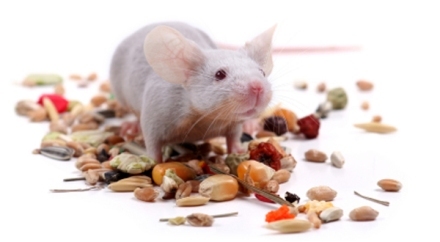 They have a number of uses, many of which are overlooked. I know that when I first heard about air curtains – I just thought that it was another version of an air-conditioning unit. Well it’s not. Firstly, an air door or air curtain is a device used to prevent air or contaminants from moving from one open space to another. The most common use is a downward-facing blower fan mounted over an entrance to a building, or an opening between two spaces conditioned at different temperatures. 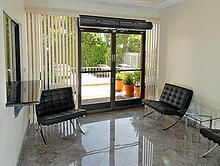 Secondly, air curtains can come with or without heaters to heat the air. And thirdly, the fan is powerful enough to generate a jet of air that can reach the floor. In its simplest application, an air curtain is a continuous broad stream of directionally-controlled airstream circulated across the entire height and width of a doorway or opening. It reduces penetration of insects, dust, debris and unconditioned air into a conditioned space by forcing an air stream over the entire entrance. 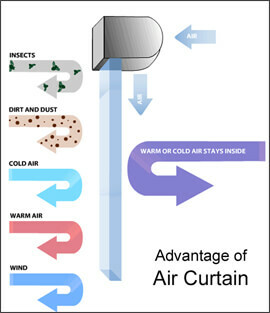 The air stream layer moves with a velocity and angle such that any air that tries to penetrate the curtain is entrained. Air curtain effectiveness in preventing infiltration through an entrance generally ranges from 60 to 80%. This factor is an important consideration, especially when comparing an air-curtain's effect against a closed door, or strip curtains for example. The next question is; what are their uses? 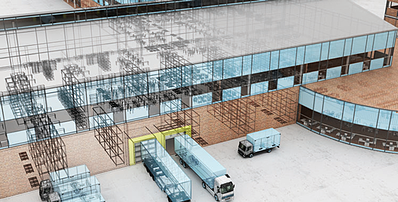 Air curtains are often used where doors are required to stay open for operational purposes, such as loading docks, vehicle entrances, pedestrian entrances to shopping malls and shopping centres, airplane hangars, cargo doors, drive through doors, restaurant doors, shipping receiving doors, hospital entrance, serving counters, hotels, café’s, butcheries, food processing warehouses– the list goes on. 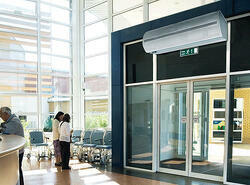 Non-heated air curtains are often used in conjunction with cold storage and refrigerated rooms. Can they be used in any doorway? The airflow through a door depends on wind forces, temperature differences and pressure differences. Air Curtains work best when the pressure differential between the inside and outside of the building is as close to neutral as possible. Negative pressures, extreme temperature differences, elevators in close proximity or extreme humidity can reduce the effectiveness of air curtains. The most effective air door for containing conditioned air inside a building with an open door will have a high face velocity at the opening, generated by top-down flow, and air recovery by a recirculating air plenum and duct return to the source fans. This configuration is feasible for new construction, but difficult to implement in existing buildings. The air door is most effective with low exterior wind velocity. At higher wind velocities, the rate of air mixing increases and the outside air portion of the total face flow increases. Under ideal conditions of zero wind, the effectiveness of the air door is at its maximum. In windy locations, air doors cannot create a perfect seal, but are often used to reduce the amount of infiltration from an opening. For industrial conditions, higher air velocities are required. For commercial applications like store entrances, user comfort dictates low face velocities, which reduce effectiveness of separation of exterior air from interior air. The UK based HEVAC Air Curtain Group describes overdoor heaters as small electric or water heated fanned units with a low air volume flow rate. They are intended to be installed at doorways having low pedestrian footfall where the door is mainly closed and are useful in providing warmth. However, they should not be seen as an alternative to an air curtain. The main differences are: Air doors are designed to fully cover the width of a doorway, whereas overdoor heaters and coolers may be too small. 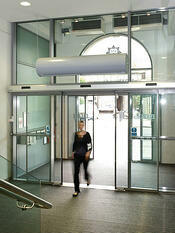 The fans in an air door are powerful enough to provide an air stream to project across the whole doorway. Overdoor heaters and coolers may have less powerful fans. The discharge nozzle on an air door is optimized to provide a uniform air stream across the whole width of the doorway, which may not be the case with overdoor heaters and coolers. 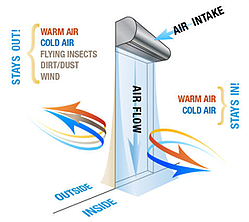 Air curtains can be used to save energy by reducing the heat transfer (via mass transfer when air mixes across the threshold) between two spaces, although a closed and well-sealed physical door is much more effective. A combination is often utilized. When the door is opened the air door turns on, minimizing air flow from inside to outside and vice versa. An air door may pay for itself in a few years by reducing the load on the building's heating or air conditioning system. Usually, there is a mechanism, such as a door switch, to turn the unit on and off as the door opens and closes, so the air door only operates when the door is open. To calculate the supply air and thermal capacity of the required air curtain for your application, contact the Remax team who can help with making sure that you have all the information at hand before making a purchase. Click here to contact the team or call 1800 010 221.